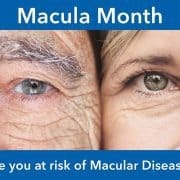 What is Macular Degeneration ? The macula is a small central area of the retina. Structures in the macula are specialised for high acuity vision. The macula is important for reading, driving, recognition of faces and fine detail. Damage to the macula, such as Macular Degeneration, can lead to a loss of central vision. There are several types of macular degeneration, but the most common is Age Related Macular Degeneration (ARMD). It is the leading cause of blindness in Australia, affecting central vision. ARMD usually occurs in people older than 50 years. The risk of ARMD is increased if you smoke or have a family history of the disease. There are two forms of ARMD. Both Dry and Wet forms of ARMD begin in the Retinal Pigment Epithelium (RPE). This layer of cells underneath the retina is responsible for passing oxygen and removing waste products from the retina. ARMD occurs when the removal of waste breaks down and waste products from the retina start to build up underneath the RPE. These deposits are known as Drusen, which is the earliest sign of ARMD. When cells in the retinal pigment epithelium die, the retinal cells above them also die, leading to patches of ‘missing’ retina. This is dry MD. This is a slower form of the disease, causing gradual loss of central vision. If you know you have dry MD and you experience any sudden change in vision, then it is likely that you have developed the ‘wet’ form. It is critical that you see your eye care professional immediately. The wet form of MD occurs when the retinal pigment epithelium (RPE) fails to stop new abnormal blood vessels from growing into the retina. When these blood vessels enter the retina, they grow profusely, and they leak fluid and blood into the retina, leading to scarring and loss of vision. If wet ARMD is left undetected or untreated, rapid and severe loss of central vision can occur within a short period of time. ARMD can only be diagnosed by examining the retina. Early stages of ARMD can be detected by using the Amsler Grid. Ask your eye care professional for one as early detection of ARMD is crucial. There are currently no treatments to reverse the effects of dry MD however you can make lifestyle changes such as taking supplements like Macuvision and Lutein Vision, eat a lot of green leafy vegetables, wear UV protection sunglasses and quit smoking. It is important to be aware that the dry form can turn into the wet form so it is important to check your Amsler grid and report any changes to your ophthalmologist immediately. Lucentis, Eylea and Avastin are Anti-VEGF drugs. They are injected into the eye to block the protein responsible for the growth of new blood vessels. The injection is into the eye cavity where the anti-VEGF drug can spread to the retina. The injections are generally administered at four week intervals. This is a two step process combining a light-activated drug Visudyne and the light from a cold laser directed on to the abnormal retinal area. Once activated, the drug causes the blood vessel to close off. PDT may need several treatments to keep the leaking blood vessels closed and stop the progression of Wet MD. After PDT you must stay out for the sun and halogen light for at least 48 hours. On the day of treatment, bring a wide brimmed hat and sunglasses. This treatment consists of a concentrated beam of high energy thermal light which is directed on to the retina to destroy and seal the leaky blood vessels. The laser not only destroys the new blood vessels but also destroys the retina adjacent to the new vessels. Therefore laser photocoagulation will usually not be used for blood vessels directly under the middle of the macula. This treatment is only for a small percentage of patients with a particular type of Wet MD. Close monitoring with your ophthalmologist is needed to determine if further treatment is required as there is a 50% recurrence rate. Modern treatments discussed above, support and maintain good vision for patients with macular degeneration. It is important to contact us if you notice any sudden changes to your vision. 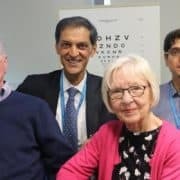 Patients and their family or carers may wish to visit Macular Disease Foundation for more information and resources about Macular Degeneration.